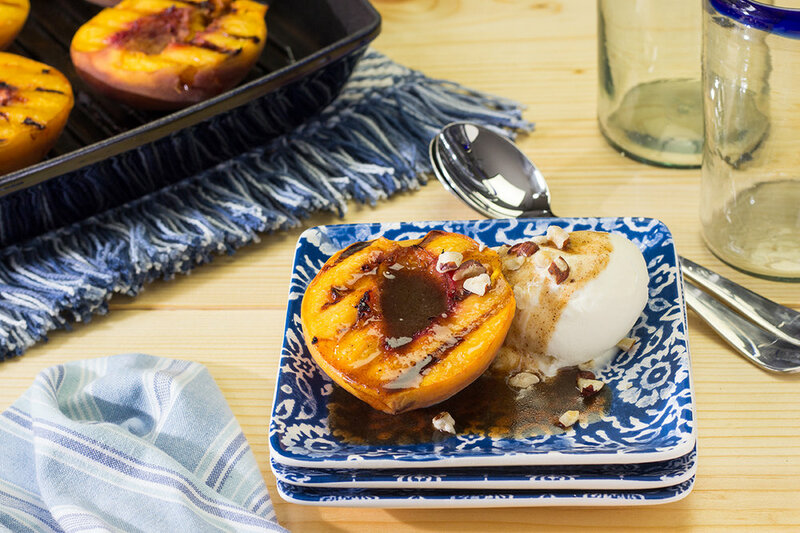 Learn how to easily remove pits from and then how to pan grill peaches. Serve warm with ice cream and a dessert sauce, such as Butter Rum Dessert Sauce. Start with free stone or free clinging peaches, most often available late during peach season. Clinging peaches have a pit that just does not remove easily. In fact, you literally have to cut away the peach flesh. NOTE: I was fortunate to find really, really large tree-riped peaches. What you see here are peaches that weight 11.5 ounces each (about 3.5" x 3.5"). Leaving skin on, make a circular cut around the peach to form two halves. With each hand on each half of the peach, twist and pull apart. Remove pit. You may want to spoon out some of the very red pit remains. Brush the edge of each peach with 100% light olive oil. 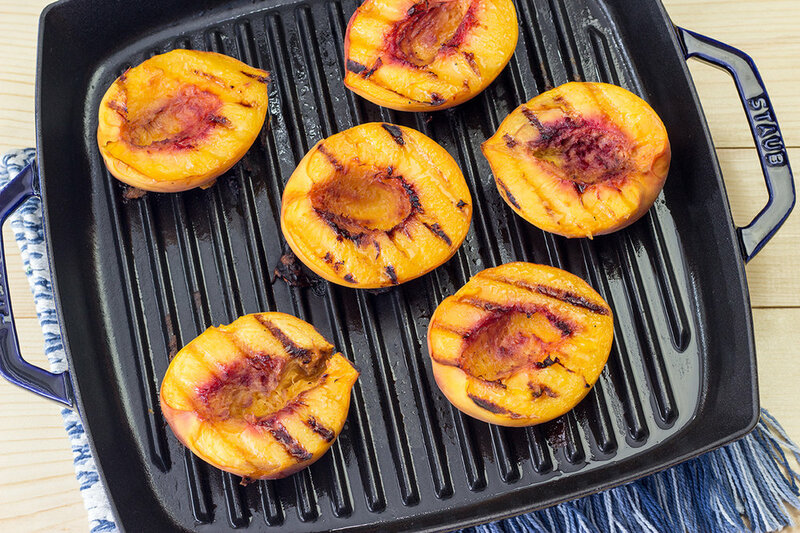 In an oiled preheated grill pan, place peaches with the flesh side down. Cook for 5 minutes on medium high (or just a little lower) heat. You may need to adjust the time for the size of peaches you have. Peaches you see in the images are very large. Check that the peaches are soft on the sides and top. Turn peaches over and cook for 5 more minutes. Serve warm. Add you favorite accompanyments, such as ice cream, whip cream, nuts, and sauces. Final note: You can of course use an outdoor grill or even a smoke grill. Preparation of the peaches is the same. Cook time may differ slightly depending upon how hot is your grill.